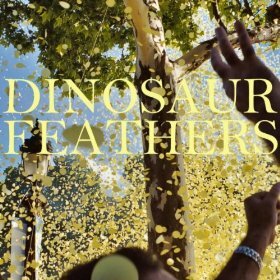 Since its inception as a solo project, Dinosaur Feathers have evolved into a mental, Brooklyn-based rock quartet. Since 2010’s debut album, Fantasy Memorial, the band has added drummer Nick Brooks and pushed forward into new territory. The result is a sunny, energetic album that’s sure to make the indie rounds this summer. Guitar rock gets turned on its head and made more interesting throughout Whistle Tips. “Young Bucks,” for instance, has surfer rock written all over it with some Beach Boys essence, while “Boats” is a clattering bit of indie rock chaos as its rich layers merge together. “City Living” feels like a jam that happened to be recorded, and the band as a whole benefits from the structure provided by a live drummer here rather than following the lead of an uncreative drum machine. “Untrue” feels like it was yanked from a 1960’s radio dial, and the fleeting “Your Move” is dreamy and synth pop goodness. Whistle Tips is an accomplished sophomore record that shows that Dinosaur Feathers have only grown in creativity and discipline. With a tight touring schedule, this band can only continue to gain more traction on the indie scene.